Let's see how the mask is coming along. Shall we? 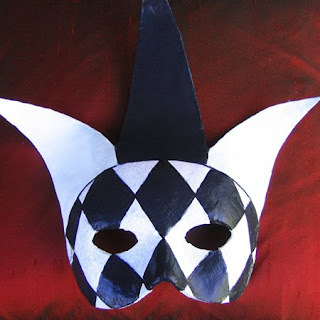 The mask will be worn at a black & white themed ball and is for a man and a jovial one at that! 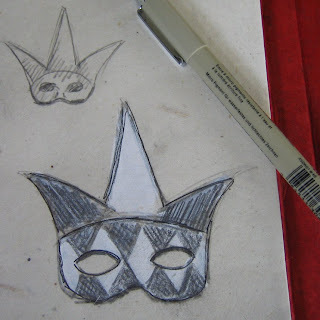 So, I decided to go with a Venetian-inspired harlequin mask with a diamond motif. I usually draw a rough sketch of the design, then use that drawing to block the outlines directly onto the mask with a Sharpie. Next is the painting process. I used a variety of types and sizes of brushes to fill in the blocking I did earlier on the mask. 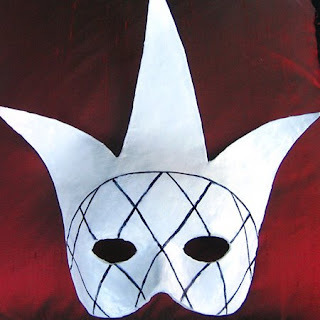 Once I finished painting in the basic design, I covered the mask with a coat of acrylic sealant. Now, the mask will be left to dry thoroughly before the next stage: embellishing.